The internet is full of funny prank videos, death prank videos or rising from the dead. Although such pranks are meant for fun, the viewers may not take it as a joke at all times. 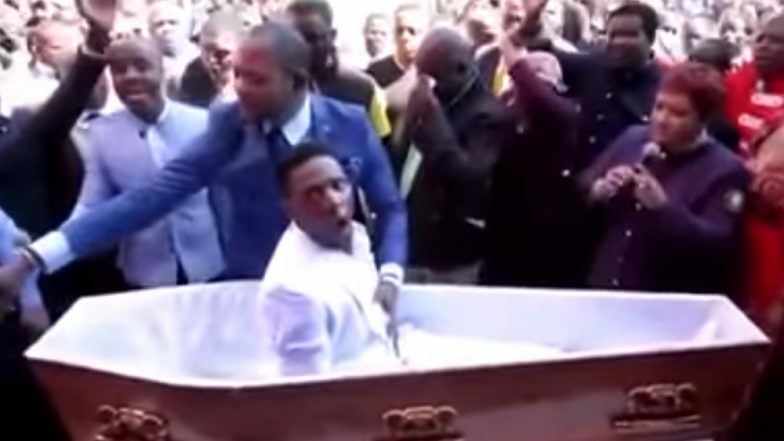 One of the death pranks that went viral a few days ago was a man in Zimbabwe who had faked his death and pretended to be resurrected. The video did not just go viral but it stirred controversy as well. But now, the man who faked his death has died for real in South Africa. Brighton Moyo played a dead man and then was resurrected by Pastor Alph Lukau in Zimbabwe has passed away due to a medical condition. Dead Man Missing for 40 Years Found in Cyprus After Fig Tree Grows from Seed in His Stomach. Moyo made it all over the headlines when a video of him went viral in February this year. The video went viral all over and Pastor Alph Lakau was condemned by many. The Commission for the Promotion and Protection of Cultural, Religious and Linguistic Communities had slammed his stunt too. Funeral companies also claimed that they were manipulated in involvement. Now, Moyo's family has confirmed that this is no dramatic death stunt, but he is really dead. Some relative of Moyo informed the media that he was buried over the weekend and he died due to some stomach swelling. He was keeping ill for three days and has passed away. Well, this time there was no coming back.